'Doozey' (Ben Hager, R. 1993). Seedling #MD5493VAm. MDB, height 5" (13 cm). Early bloom and rebloom. 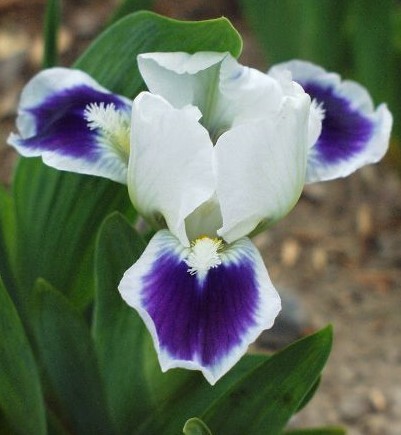 Standards white; falls mid-violet to purple, white rim; white beards. Seedling #AMD4972TyAm: (('Little You' x ('Inca Toy' x (seedling #BU67 x ('Atomic Blue'))) x ('Ditto' sibling x (((('Orange Caper' x 'Shine Boy' x 'Dark Fairy')) x seedling #SD1997D: ('Rickshaw' x 'Lilli-Var')) x 'Wink') x ((seedling #SD1997 x 'Bongo') x ('Russet Dot' x seedling #SD1997))))) X 'Ditto'. Adamgrove 1994.